Do you need to register for an IC&RC examination? Registration eligibility and fees are determined by IC&RC Member Boards. To register for an IC&RC examination, please contact the IC&RC Member Board in your jurisdiction. The contact information for all IC&RC Member Boards can be found in our Member Board Directory. All examination candidates should download the Candidate Guide for their respective examination. Candidate Guides are a free resource that provide important information regarding examination administration and content of the examination. Candidate Guides for all IC&RC examinations can be found on our Examination Prep page. 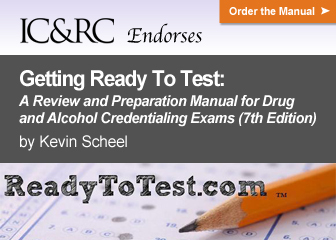 IC&RC endorses or recommends a variety of preparatory materials depending on the examination you are taking. Preparatory materials can include recommended reading lists, endorsed study guides, practice examinations or sample questions. Check out our Examination Prep page for more detailed information. Need a copy of your IC&RC examination score verified? Complete the Exam Score Verification Form and we will get your score verification to where you need it to be.